In many sports, especially those that require a very important mobility such as overhead squats, squat, pistol squat or lunge, ankle range of motion is essential. From its amplitude will arise the placement of the proximal joints such as the knees and the hips, for example and from that the forward trunk lean. Indeed, as we discussed in a previous article, a reduced mobility of the ankle will cause a more pronounced forward trunk lean. If in squat, this movement is still possible even if less effective (and potentially more dangerous for the lower back), in overhead squat, the exercise will be much harder to achieve since the load must be maintained at arm's length above the head, the shoulders will have to compensate (both in terms of mobility and strength) even more to keep this load in place above the center of gravity. Figure 1. 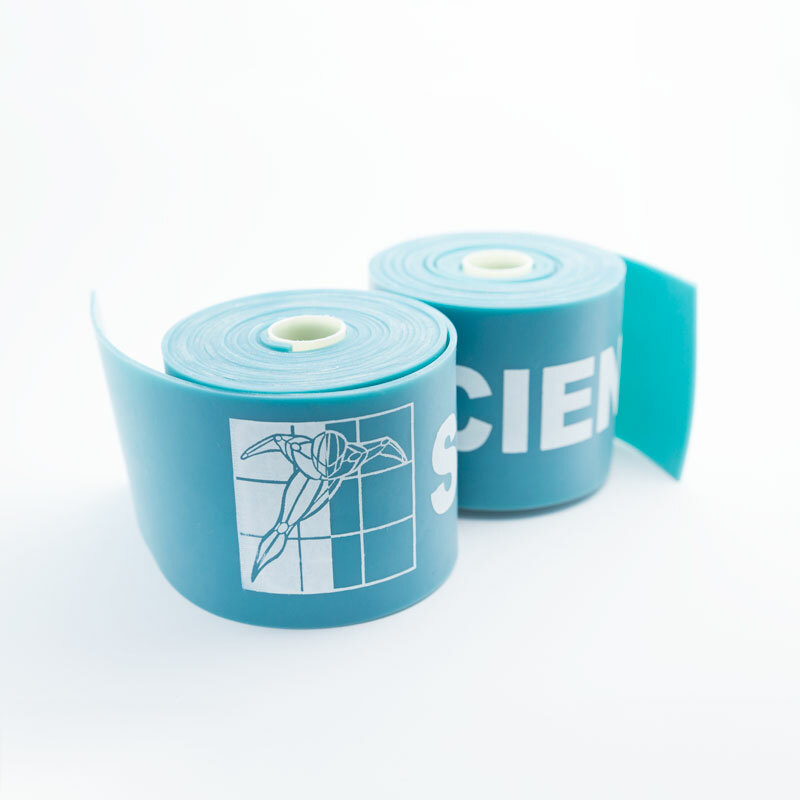 Floss Bands Sci-Sport. To work on joint mobility, there are many methods, more or less new (stretching, self-myofascial release, banded distractions, etc.) and that act at the level of the soft tissues or at the level of the joint itself. Foam rolling massages have become the most famous technique in recent years and several scientific publications have shown the benefits they can have on mobility (read our articles here, there, here or even here). Although the reasons for those benefits are not yet fully understood, they allow in a few minutes to gain several degrees of joint range of motion. Kelly Starrett, co-author of the book Supple Leopard (which we translated in French for 4Trainer editions) and founder of MobilityWOD was one of the leading personalities in the CrossFit community to popularize the different mobility techniques. He was also the first to discuss a technique called Flossing which consists of wrapping a thin but wide elastic band around a joint to create a compression and limit the blood supply, while mobilizing this joint to the maximum of its anatomical range of motion (Fig. 1 & 2). The principles of this technique would be based initially on the mechanical shearing action on the soft tissues surrounding the joint caused by the mobilization and in a second time on the blood flow during the removal of the band which is supposed to create a detachment of connective tissue inside the joint. If these principles of action are still purely speculative, what about the effect of flossing on the ankle mobility ? To answer this question, two New Zealand researchers wanted to study the impact of flossing on joint mobility of the ankle and performance in vertical jump. For this, they recruited 52 sports students (23 women and 29 men) that they submitted to various tests then to whom they asked to carry out mobilizations with floss bands, before submitting them to the same tests. To control the effect of flossing on ankle mobility, the participants performed ankle mobilizations with an ankle equipped with the floss band and an ankle without floss band. The mobilization of the ankle was performed in a seated position and the participants had to mobilize their ankles in maximal plantar and dorsi-flexion without external help (just muscular strength). The mobilizations were performed during 2 minutes. Figure 2. Floss Band set-up around the ankle. Start by wrapping the foot then make your way up with each subsequent wrap overlapping the previous by 50%. Before and after the joint mobilizations, the participants carried out several tests. The first was to make a lunge facing a wall, with the aim of moving the hallux (the big toe) away from the wall while being able to stick the knee to the wall without taking off the heel from the ground. The maximum distance between the wall and the toe was measured. The second test consisted of measuring dorsiflexion and plantar flexion with a goniometer when participants were lying on their back and achieving maximum amplitude without external assistance. Finally, the last test was to make 3 unilateral jumps with counter-movement. The measurements of the maximal height as well as the maximal velocity were performed with a linear transducer (GymAware). The main results of this study show that mobilizing the ankle with a floss band for 2 minutes significantly improves dorsiflexion, plantar flexion, jump height and jump speed. In comparison, mobilization of the control ankle without floss band resulted in no significant improvement. On the other hand, when comparing the two ankles, only the dorsiflexion and the maximum jump speed were significantly higher (although the effect size is small) for the ankle with floss band (Table 1). The results and the protocol of this study do not allow to know the physiological reasons for these improvements. As explained in our introduction, at this stage, the explanations for the fascial mechanical shearing and the detachment of tissue within the joint remain purely speculative. Further studies are needed to confirm the results and understand the physiological principles underlying this technique. It should also be noted that during this protocol the mobilizations were carried out in an active way, only by muscular strength. It would be very interesting to see if passive mobilization with body weight as a mobilizing force in a lunge position, for example (as advocated by Kelly Starrett) could allow additional gains and a larger effect size. Driller MW and Overmayer RG. The effects of tissue flossing on ankle range of motion and jump performance. Phys Ther Sport 25 : 20-24, 2016. Driller MW, Mackay K, Mills B and Tavares F. Tissue flossing on ankle range of motion, jump and sprint performance: A follow-up study Phys Ther Sport 28 : 29-33, 2017.